Inglesham is a replica Thames launch, purpose built for charters and river trips on the Upper Thames at Lechlade. 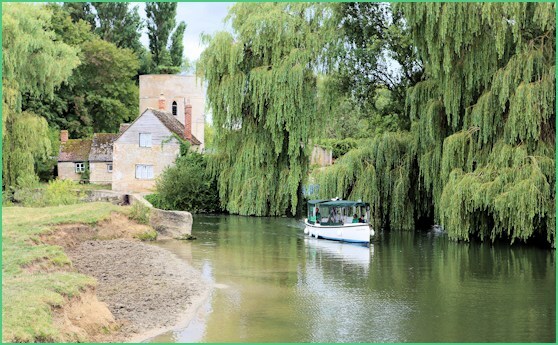 We can accommodate up to 12 passengers for a comfortable and relaxing cruise on this historic river. Charter Trips normally depart from St Johns Lock. From Lechlade Town Centre take the A417 towards Faringdon. After about half a mile turn left just before the Trout Inn, signposted to Kelmscott Manor then immediately right into the Trout Inn car park. Thanks to the management of the Trout Inn, on arrival you may park in their car park.Please drive through the car park and park in the field beyond. From The Trout Inn walk across the bridge (care - traffic) and through the small gate on the right. The boat is usually moored on the walkway above the lock. Please refer to the map sent to you with your booking confirmation. If you have arranged to meet the boat at a location other than St. John's lock then refer to the information sent with your booking confirmation. Finally be aware there are three Trout Inns at various points on the River Thames, you want the one at Lechlade. The Trout Inn is upper right in this aerial shot, St Johns lock is lower left.